In just one more nod to the passing of Hiram Bullock, we're featuring his artist model by Cort. A better view & specs available by clicking the image. The neck is actually beautiful bird's eye maple, and the body is swamp ash with what Cort calls a "Burnt Open Pore" finish, hence the BOP model designator. Pretty striking grain pattern! The HSH pickup configuration is a Hiram Bullock trademark. The HBS II BOP model is street priced in the $500 area. Considering the specs, hdwr & electronics, this Korean manufactured guitar offers a LOT of bang for the buck! If you're considering an MIM Fender but not necessarily married to the lazy F name, you might check these out. Cort has an impressive artist list in their signature instrument series too. 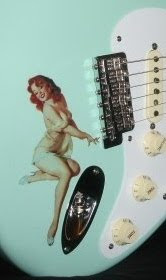 Harmony Central reviews on this guitar rank it in the 9 & 10 range.